When it came time for my return flight from Seattle to San Francisco, I thought it might be interesting to try public transit to the airport. 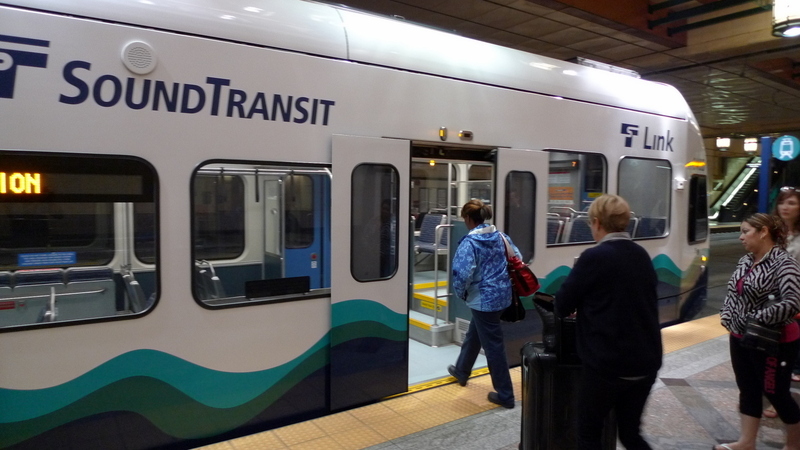 I was staying with a friend on Capitol Hill, just northeast of downtown, and a short bus ride to the Central Link light rail that runs to Seattle Tacoma International Airport, about ten miles south of the city. The first step of the journey involved taking a seven-minute bus ride down the hill to the Westlake station at Fourth and Pine Streets. The bus stop was just a block from my friend’s house and a handy free iPhone app called OneBusAway (developed by the University of Washington) let me know exactly when the next bus was coming, minimizing my waiting time. The ride ended up being free because one of the other waiting passengers had accidentally been given two transfers on his connecting bus, so he gave one to me. Normally, it would be a $2.25 ride. The Westlake station will be the northern current terminus of the light rail line until 2016 and announcements on the bus made it easy to tell which stop to alight at. Going down two flights of escalators, I found a small ticketing lobby with easy to use self-service ticketing machines. The machines take both cash and cards. 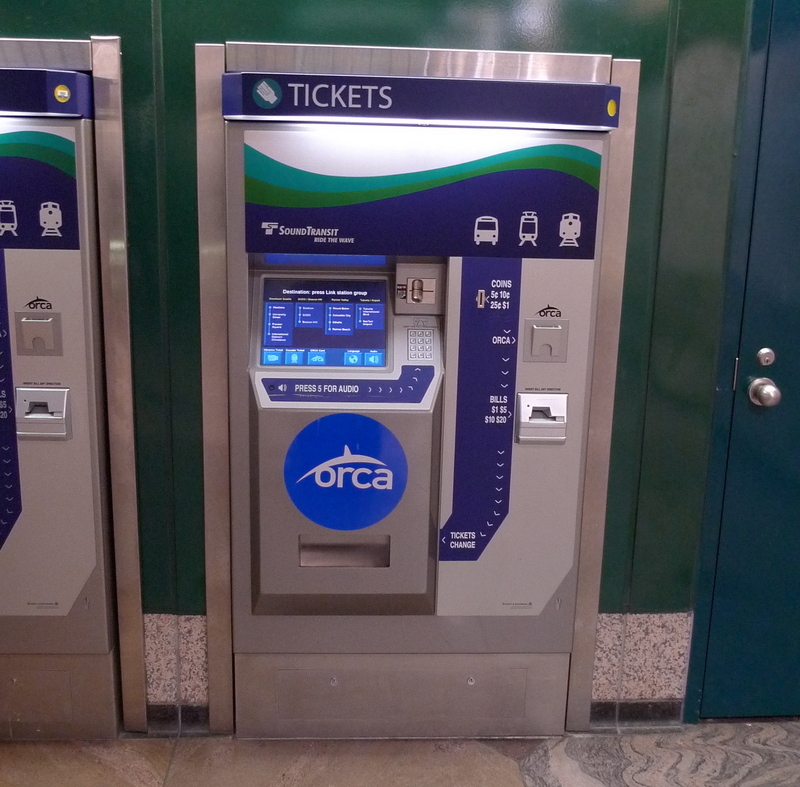 “Orca” is the name of the multi-modal fare card in the Seattle area. It stands for “One Regional Card for All” and is, of course, the proper name of the killer whales found in nearby Puget Sound – clever. From the ticketing lobby I descended another level to the Downtown Seattle Transit Tunnel. This 1.3-mile tunnel opened in 1990 and provides a convenient, congestion-free path for buses and light rail trains through the heart of Seattle while also providing passengers protection from the elements while waiting. It seems to be a useful piece of infrastructure. My adult ticket – $2.75 one-way to the airport. Travel time to the aiport from downtown is 36 minutes, not much longer than what a trip by car would be, without the worries of traffic – and in Seattle, there is usually traffic. Signage in the station was clear – different bus lines stop in different sections of the platform – and there were staff members present to answer questions. Frequency of the light rail runs from every 7.5 to every 15 minutes, depending on the time of day. I had less than a five-minute wait before my train arrived. Many passengers boarded at this first station, including several who were clearly going to the airport. Average weekday ridership for the 15.6-mile route is about 25,500, growing at a steady but modest pace. The two-car trains have a capacity of 74 seated and 126 standing passengers, although it would be hard to imagine that many people standing in this train, especially with the number of people bringing luggage aboard. With the airport as an important destination, there is a surprisingly small amount of storage space for luggage. Leaving Westlake station, the line passes nine stations at a pretty quick rate, stopping at a station every two or three minutes. The final two stations, though, are much further out with nine minutes between the tenth and eleventh stations. This is a long distance for light rail to run with no stops and as far as I can tell, the route includes no provisions for in-fill stations to be added. Two minutes afer leaving the second-to-last station, you pull into the SeaTac Airport station. This neatly organized station has a view of the north end of the airport terminal and signage directing you to the airport is clear. Unfortunately, it is an open-air station and I imagine that it gets very unpleasant waiting for a train in the winter. It looks, though, like the usually have an outbound train waiting in the station so passengers do not have to stand out in the elements for long. A view of the airport light rail station, which is built northeast of the parking garage and is connected via a pedestrian bridge and walkway that is partially protected from the elements. Sound Transit, the light rail operator, says it is a four-minute walk to the airport terminal. That would be a brisk four minutes, especially if you have luggage, and would only get you to the northernmost corner of the terminal. For most people, especially those not flying Alaska Airlines, ten to fifteen minutes would be a better estimate. 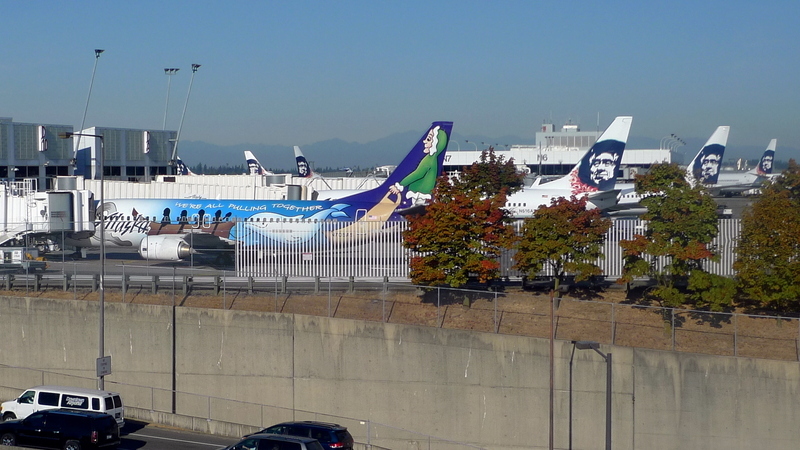 View of the hometown airline, Alaska Airlines, from the light rail station. I’m a fan of public transit and am glad that one more city in America has made its airport more accessible via transit. The Central Link light rail is convenient to use, reasonably comfortable (of course it was unseasonably pleasant weather when I rode it), and offers a good return on money for time. If you live anywhere near downtown (or along the light rail route), it is a compelling alternative to a taxi or private car. Of course, not everyone in Seattle lives near the light rail, which is always the challenge of public transit. Still, my overall impression of the Seattle light rail is a positive one. This entry was posted in Uncategorized and tagged airport, central, light, lightrail, link, public, rail, seatac, seattle, transit by christao408. Bookmark the permalink. We don’t have anything like that here. All we have are a couple little buses that look like trolleys. I rarely see anyone riding them. Probably due to the fact that they only go through a select few streets. The Seattle airport has always been pretty innovative — this looks like a wonderful addition, albeit perhaps modeled a little after BART. Thanks for sharing this! Oh – too bad Toronto doesn’t have something like this. *shakes head* We have a mayor who has absolutely no concept of urban planning and public transportation. How I wish transportation in Manila is as nice as else where in the world. Sigh. It looks very interesting! I bet it pales in comparison to the Bangkok transit system. Now that looks like fun. When I get to Seattle, that’s one of the things I want to do. @murisopsis – Actually, not so much. Bangkok is a much larger city but each of our transit system elements – bus, rail, boat – are very disjointed. No thought is given to making the parts into an efficient whole. 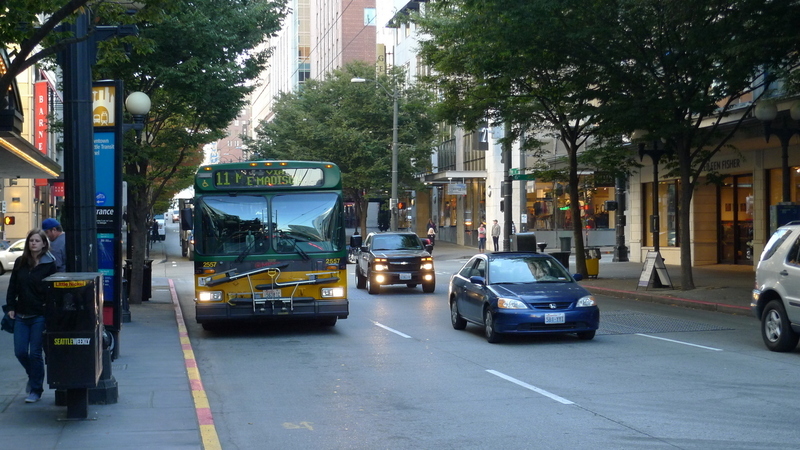 Seattle, with a more limited system, is much more cohesive. @ShadesOfAnnie – If you are staying in the downtown area, I’d recommend it. No need for a car! @oxyGENE_08 – I know, I know… (pats back supportively)@ElusiveWords – You know, I’ve flown into Toronto at least a dozen times in as many years and have never understood why that key link – rail to the airport – is still stuck in the planning mode. Traffic in TO is terrible, the airport is quite a ways from downtown but passes through populated areas, and there is an existing rail network that is pretty decent. Seems like the dots could be connected easily enough. @slmret – Thankfully, a bit newer and cleaner than BART! =D@chronic_masticator – I suppose you need a certain density of population to make a transit system effective. The year before I moved to Bangkok, I lived in suburban Kansas City, another area whose bus service just makes you roll your eyes. @christao408 – We’re very rural. Our buses only run down the main street downtown and to Walmart. St. Louis, the closest Metropolitan city has a transit system that links down town to the Lambert Airfield. But I have heard a lot of complaints about it. Chicago is not any better apparently. I am glad you have had such a positive experience of public transit system. Ah, good public transportation is so wonderful. I miss Seoul’s system very often but at least Gwangju has decent bus routes. All handicap accessible, I presume. I always wonder when LA will construct something like this, probably in a long long time?